I'm using some of the newest products from Essentials by Ellen, that are available starting today! I started with a watercolour panel and inked up the newest Mondo flower (Mondo Sakura) with Versamark, and embossed with Alabaster embossing powder. I wanted the petals to be mostly white, with soft pink centres, so I watercoloured the flowers by filling each each petal with water and then laying down some It's A Girl ink in the centres, and letting the pigment travel in the water. This results in a natural fade out. Once the petals were dry, I added a layer of pink in the centres for more intense colour. I added some Garden Green to the stems and filled in the background with Skylight and filled in the stamens with a Zig Clean Color Real Brush marker. To add interest, I used the matching die to cut out the flowers and placed them in the bottom left corner. Using some of the 'off-cut' watercoloured background, I cut out MOM using the new Block Alphabet dies and popped them up with foam tape. I used some of the script sentiments from the new Totally Random Sayings Version 2, stamped in Black Jack ink. 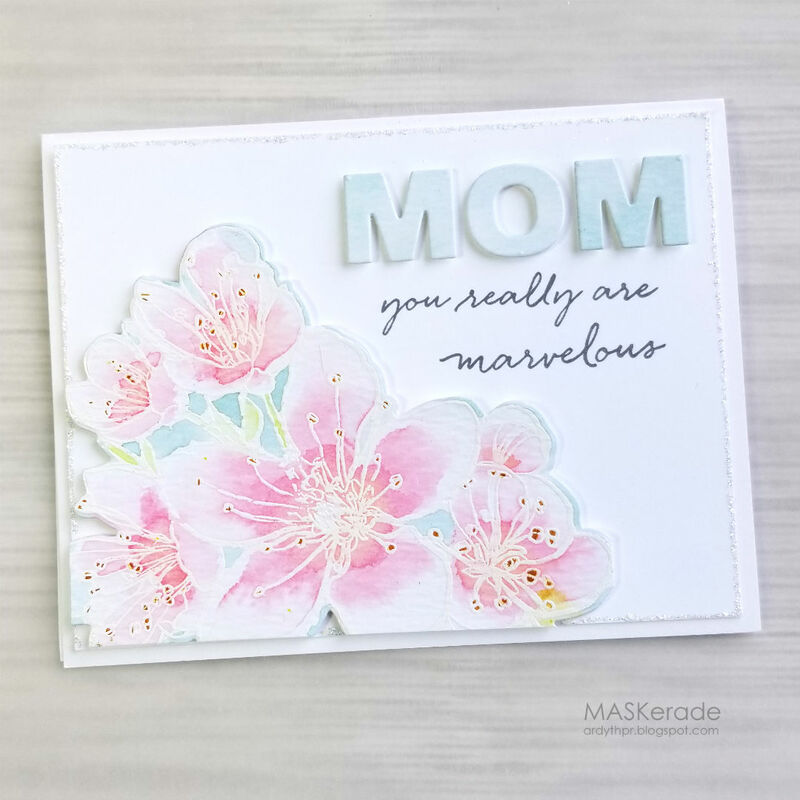 Beautiful card...love those sweet flowers and your sentiment is amazing! What a beautiful card Ardyth - love your water colouring and the fabulous die cut made from the off cuts.